Leave a Comment on Read full Bible Society Report here!! Read full Bible Society Report here!! Easter and other Bible stories unknown to many in our current generation. Read the full Bible in the UK report here! Leave a Comment on E-Letter Sign Up!! Leave a Comment on Netflix & Faith based entertainment!! Netflix & Faith based entertainment!! Leave a Comment on The Easter Bible Story told in a new exciting way!! The Easter Bible Story told in a new exciting way!! EASTER BIBLE STORY told in a new and exciting way!! A UK version of The Passion TV Special is coming to the UK. Pray. Donate. Support. Telling the true story of Easter. Blinded by Your Grace - A great example of faith expressed in pop culture....more songs like this please!! We would love Stormzy to come and perform with us at The Passion next year!!! Easter Story in context: What would you do if you received a text saying Jesus is alive! UK Passion shared a post. 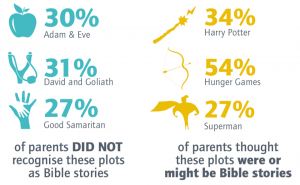 Reaching the next generation with the Easter Story must include media and entertainment. "A YouGov poll on social attitudes among 18-24 year olds in Great Britain in June 2013 found that of the over 900 polled, parents (82%), friends (77%), politicians (38%), brands (32%) and celebrities (21%) were more important influences over them than religious leaders, who came in last with 12%." Is Easter still about religion for most? Many of us say we have no religion, but Caroline Wyatt believes there is a hunger for some kind of spiritual meaning in life. "A few years ago, the Archbishop of York, Dr John Sentamu, in his Easter Sunday sermon, expressed his regret that nearly a third of British children in one survey said they thought that Easter marked the birth of the Easter bunny, while over half had no idea of its religious significance."